Michael Pollan's definitive compendium, Food Rules, is here brought to colorful life with the addition of Maira Kalman's beloved illustrations. This brilliant pairing is rooted in Pollan's and Kalman's shared appreciation for eating's pleasures, and their understanding that eating doesn't have to be so complicated. Written with the clarity, concision, and wit that is Michael Pollan's trademark, this indispensable handbook lays out a set of straightforward, memorable rules for eating wisely. Kalman's paintings remind us that there is delight in learning to eat well. MICHAEL POLLAN is the author of five previous books, including In Defense of Food, The Omnivore's Dilemma, and The Botany of Desire, all New York Times bestsellers. A longtime contributor to the New York Times, he is also the Knight Professor of Journalism at Berkeley. In 2010 Time magazine named him on of the 100 most influential people in the world. 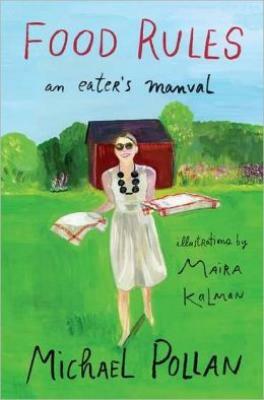 MAIRA KALMAN is an illustrator, author, and designer. She is the author of And the Pursuit of Happiness and The Principles of Uncertainty, and she illustrated the bestselling edition of William Strunk and E.B. White's The Elements of Style. Kalman's work is shown at the Julie Saul Gallery in Manhattan.